Retired Supreme Court Justice John Paul Stevens said Thursday that he does not support the confirmation of Judge Brett Kavanaugh. Kavanaugh “had the qualifications” to be a Supreme Court justice but his behavior at a hearing last week ― where he defended himself against allegations of sexual assault by blaming Democrats seeking “revenge on behalf of the Clintons” ― was inappropriate and disqualifying, Stevens said. Former justices do not normally comment on pending Supreme Court nominations, and Stevens is the only living former justice to comment on whether Kavanaugh should be confirmed. Sandra Day O’Connor, David Souter and Anthony Kennedy, whom Kavanaugh was nominated to replace, have not said anything about the nomination process. Few figures could be more dissimilar from each other than Stevens and Kavanaugh. Stevens was nominated by Republican President Gerald Ford in 1975. He went on to become the most liberal member of a minority bloc on the Supreme Court. He retired in 2010 and was replaced by Justice Elena Kagan. Kavanaugh has been a partisan political operative, working with Republicans to investigate President Bill Clinton and helping George W. Bush win the Bush v. Gore court case in 2000 before being nominated to a seat on the D.C. Circuit Court of Appeals. (Stevens dissented in Bush v. Gore.) He was chosen to fill Kennedy’s seat because conservatives are assured that he will be a reliable conservative vote, unlike Stevens (or Souter). Stevens also noted on Thursday that the partisan political influence over the high court was “worse” than ever. “I’ve never been a political person,” he added. WASHINGTON — Judge Brett M. Kavanaugh, the embattled Supreme Court nominee, defended his impartiality and independence on Thursday in an unusually public attempt to assuage concerns about his judicial temperament after his emotional and often viscerally angry testimony last week rebutting allegations of sexual misconduct. “You can count on me to be the same kind of judge and person I have been for my entire 28-year legal career,” Judge Kavanaugh wrote in an opinion piece published in The Wall Street Journal. He acknowledged that he had regrets about some of the things he said in his testimony last week before the Senate Judiciary Committee, but did not specify what they were. The op-ed appeared to be directed at a handful of lawmakers who remained publicly undecided before a vote Friday morning that would end debate over his nomination and set the stage for a final decision on his confirmation. Republicans had appeared increasingly confident on Thursday that Judge Kavanaugh would be confirmed, though a no vote from three of the four publicly undecided senators — Jeff Flake of Arizona, Susan Collins of Maine, Lisa Murkowski of Alaska and Joe Manchin III of West Virginia — could derail the proceedings. Before answering questions from lawmakers about the allegations last week, Judge Kavanaugh had denounced the accusations in a prepared statement as “a calculated and orchestrated political hit” intended in part to exact “revenge on behalf of the Clintons.” He also accused Democratic senators of “lying in wait” with the initial allegation, revealing it only when other attempts to block his confirmation failed. That language, coupled with Judge Kavanaugh’s often combative and bitter demeanor during the hearing, drew scrutiny to the judge’s temperament in the days after the hearing. Earlier on Thursday, former Justice John Paul Stevens told a group of retirees in Florida that he felt Judge Kavanaugh’s performance should disqualify him from the nation’s highest court, and thousands of law professors delivered a letter to senators echoing that sentiment. The piece was the second time the judge had taken the rare step of publicly speaking out during the nomination process in the weeks since Christine Blasey Ford, a research psychologist, came forward with allegations that he had assaulted her at a high school party more than three decades ago. He first delivered a stoic rebuttal during a prime-time Fox News interview before his second hearing, an appearance that starkly contrasted with the teary, red-faced defiance he voiced before lawmakers last week. Does Donald Trump deserve to win a Nobel Peace Prize? According to the Nobel Peace Prize committee, there there are 331 nominees for the 2018 prize. The list is heavily guarded but many have speculated who is on it. In this Sept. 13, 2017, file photo activists from the International Campaign to Abolish Nuclear Weapons (ICAN) protest President Donald Trump and North Korean ruler Kim Jong Un in front of the U.S. embassy in Berlin, Germany. In these politically and culturally fractious times, it may be the ultimate geopolitical conversation starter (or stopper): Does Donald Trump deserve a Nobel Peace Prize? Trump’s critics vehemently assert that the question isn’t even worth asking. Just look at his foreign policy adventures (they say): Trump has deepened trade wars; walked away from the Iran nuclear pact; pulled out of the Paris climate change accord; exacerbated tensions with NATO allies; rolled back improving ties with Cuba; separated immigrant children from their parents at the border; and poured salt on Palestinian wounds by recognizing Jerusalem as Israel’s capital. More broadly, he’s played fast and loose with many fundamental assumptions about diplomacy, society and, well, civility. Why on Earth should such activity be rewarded with the world’s most prestigious accolade? Alfred Nobel, its instigator, wanted the prize to go to “those who, during the preceding year, shall have conferred the greatest benefit on mankind.” Is that Trump? The short answer (for Trump’s backers and enthusiasts), including Republican lawmakers who have nominated him, is that it can’t be ruled out. Exhibit A: During his 20-month tenure Trump has already achieved something that’s eluded every U.S. high office holder for the past quarter-century: He has convinced a reclusive and recalcitrant North Korea to agree — albeit on the vaguest of terms — to talk about halting its nuclear weapons program. As he prepared to leave office in 2017, former President Barack Obama, who pursued a policy of “strategic patience” with Kim Jong Un over his nuclear arsenal, considered North Korea to be the U.S.’s top national security priority. Obama won the Nobel Peace Prize after just eight-and-a-half months in the White House. He got nowhere with North Korea. Last week, Trump said he and Kim “fell in love” after exchanging “beautiful letters.” That looks like progress. With the Nobel Peace Prize to be announced Friday, USA TODAY asked foreign policy specialists and international relations experts to respond to the following question: “Does Donald Trump deserve a Nobel Peace Prize for his efforts at denuclearization on the Korean Peninsula.” Here’s what they said. “The breakthrough in relations was the critical element in shifting the ground toward peace, something that was unprecedented in U.S./North Korean relations. Even though a final denuclearization deal is not yet set, the breakthrough itself was what set the course … President Trump achieved this unprecedented diplomatic breakthrough, in large part because he was willing to first show strength, then express conciliation. This impressed Kim greatly, and Mr. Trump has since demonstrated great respect for his North Korean counterpart … Given the long duration and intensity of the conflict (since 1950), as well as more proximate crisis atmosphere that was defused, what President Trump achieved – and which few thought was even possible – more than merits the Nobel Peace Prize. It was a masterful example of the art of the deal. Alfred Nobel amassed a great fortune when he patented dynamite in 1867. Worried about a legacy of destruction, Nobel’s will established the Nobel Prizes upon his death. Nobel’s will caused a lot of controversy both in Sweden and internationally. “To me it’s a silly conversation well suited perhaps for a European cocktail circuit audience. It would be too Obama-esque to accept a Nobel Prize prematurely. The goal of a U.S. president should be to keep Americans safe, not win Nobel Prizes, and I think the Trump administration is rightly focused on the former. “Trump deserves credit for helping to lower tensions on the Korean Peninsula, which is very significant indeed. However, North Korea is notorious for rowing back on its commitments with regard to nuclear weapons. My point is simply that it is too early to say that denuclearization has been achieved. Trump does not deserve the Nobel Prize for his North Korea policy for several reasons. “Everyone thinks so, but I would never say it,” the 45th president of the United States said in May, of himself, when addressing recent diplomatic progress made with North Korea and whether he deserved to collect the $1 million prize. Trump’s comment came in the wake of remarks made by South Korean President Moon. “President Trump should win the Nobel Peace Prize. The only thing we need is peace,” Mood said. More: Nobel Peace Prize: Who will win in 2018? What do you think? Should Trump win the Nobel Peace Prize, if not this year then next? You can write to USA TODAY reporters Kim Hjelmgaard (khjelmgaard@usatoday.com) and Deirdre Shesgreen (dshesgreen@usatoday.com) with your views. 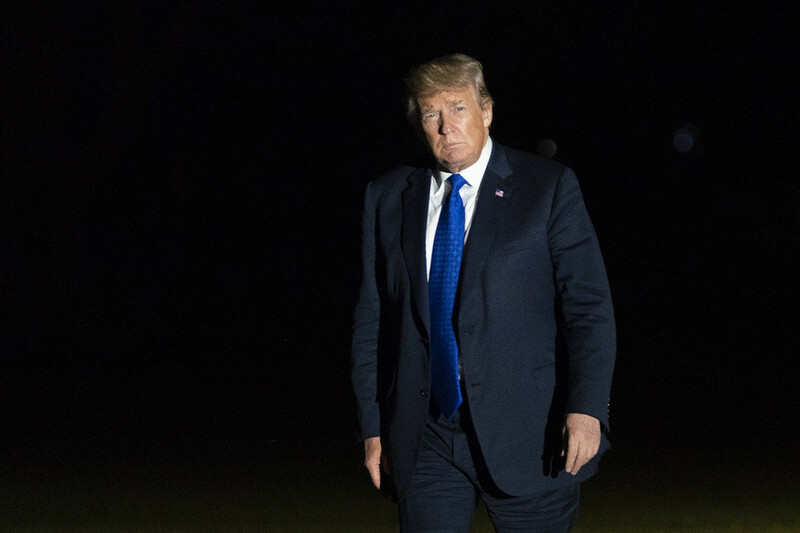 President Donald Trump on Thursday declared that the allegations of sexual misconduct against Supreme Court nominee Brett Kavanaugh are “totally uncorroborated” and will possibly benefit Republicans in the upcoming midterms. “The harsh and unfair treatment of Judge Brett Kavanaugh is having an incredible upward impact on voters. The PEOPLE get it far better than the politicians. Most importantly, this great life cannot be ruined by mean & despicable Democrats and totally uncorroborated allegations!” he tweeted. The tweet came as senators were set to begin reviewing the results of an FBI investigation into the allegations against Kavanaugh levied by Christine Blasey Ford, who claims Kavanaugh sexually assaulted her when they were in high school. After a cascade of leaked confidential information related to Kavanaugh’s confirmation, only senators and a select few staffers can review the investigation under strict time restrictions. The White House received the results of the FBI investigation ahead of the senators’ review. White House spokesman Raj Shah said on CNN he can’t discuss the contents of the investigation or provide a list of who was interviewed, though Ford’s lawyers have said their client was never interviewed by the FBI. Several friends and colleagues of Ford and Kavanaugh have spoken publicly about their recollections, including classmates who said Kavanaugh largely underplayed his drinking during his testimony last week. The most reliable politics newsletter. Sign up for POLITICO Playbook and get the latest news, every morning — in your inbox. “If we made it 100, it would still not be good enough for the Obstructionist Democrats,” the president continued. Trump’s tweet also comes as midterm elections approach, with Republicans facing a dramatic wave of Democratic challengers. The president also tweeted Wednesday about his confidence in a large Republican victory, saying Democrats’ grilling of Kavanaugh will lead Americans to vote Republican. “VOTERS ARE REALLY ANGRY AT THE VICIOUS AND DESPICABLE WAY DEMOCRATS ARE TREATING BRETT KAVANAUGH!” he tweeted Wednesday. Patriots WR Julian Edelman returned from a four-game suspension Thursday night. It wasn’t necessarily pretty — for either side — but the New England Patriots fended off the Indianapolis Colts 38-24 on Thursday night, putting themselves in position to reclaim a share of the AFC East lead. Returning from a PED suspension, New England WR Julian Edelman played his first meaningful game since Super Bowl LI (he missed the 2017 season with a knee injury). He generally looked like his old self, hauling in seven Tom Brady passes (most among Patriots wideouts) for 57 yards, though did have a drop in the first half that cost his team a first down and big chunk of yards. Meanwhile, Brady had another record-setting night, finishing with 341 yards and three TDs through the air while adding another on one of his patented goal-line sneaks. He did suffer two interceptions in a game that got uncomfortably close early in the fourth quarter before New England pulled away. Week 5 picks: Who wins Battle of Texas, NFL title game rematch? The Miami Dolphins (3-1), who were blown out by the Patriots in Week 4, go to Cincinnati to face the Bengals (3-1) on Sunday. A Miami loss would drop them into a first-place tie with New England. More TB12 milestones: Brady’s fourth-quarter TD pass to Josh Gordon was the 71st of his career to a different player, a new NFL record (Brady tied Vinny Testaverde in Week 4). It was Brady’s third scoring strike of the night and 500th of his career as he joined Peyton Manning (539) and Brett Favre (508) in the 500 club. 5⃣0⃣0⃣ regular season TD passes. The most TD targets in @NFL history. Hard Luck Colts: Indianapolis fell to 1-4, falling into the AFC South cellar. But it’s evident a rebuilding team, still short of talent in many areas, will not be pushed around. Despite not having WR T.Y. Hilton (hamstring) and a losing a litany of defensive players, including stud rookie LB Darius Leonard (ankle), the Colts hung around most of the night. Andrew Luck continues to look like the ballyhooed player taken atop the 2012 draft as he travels the road back from shoulder surgery. He battled gamely (365 yards, 2 TDs) despite being undermined by numerous drops from his receivers. K Adam Vinatieri banged a field goal attempt off an upright in the first half, much to the delight of the New England fans who used to root for him. And the defense, which has shown great improvement under new coordinator Matt Eberflus, eventually gave out late after hemorrhaging too many starters. Gutsy Gronk: Patriots TE Rob Gronkowski played despite being limited all week by an ankle injury that had initially cast his status in doubt. He caught six passes for 75 yards, but was involved in an interception of Brady after a ball Gronk seemed to have possession of was jarred loose. He looked gimpy at times, but earned a 10-day rest heading into New England’s next contest, one sure to be hyped when they welcome Patrick Mahomes and the Kansas City Chiefs on Sunday Night Football in Week 6. “I know one thing about in my 12 years of Catholic Church was that crucifixion was an important event because it was designed to establish a wall between justice and mob rule,” Gutfeld said. And that’s apparently what Democrats have done to Kavanaugh. Kavanaugh, who has been accused of sexual misconduct by several women, appears to be days away from a lifetime appointment to the Supreme Court. Max Muncy rounds the bases after a three-run homer in the second inning. Dodgers 5, Braves 0: Dodgers lead the series 1-0. Game: The Dodgers, without Clayton Kershaw on the mound, cruised to a 6-0 victory over the Braves, who returned to the postseason for the first time since 2013. The Dodgers put on a power display early and late to account for five of six runs. Braves starter Mike Foltynewicz, who allowed 17 homers over 183 innings during the regular season, coughed up two of them in his first 12 batters. Dodgers’ Joc Pederson, who set the franchise record for leadoff home runs this year, hit a leadoff homer and Max Muncy added a three-run rainbow shot in the second inning to stake Hyun-Jin Ryu to a 4-0 lead. Enrique Hernandez added a solo homer off Brad Bach in the sixth inning for a 5-0 lead. Ryu was exceptionally sharp with his command, using a combination of cutters, curves and change-ups to put a very aggressive offensive team on its heels. In the end, he allowed four hits — all singles — and struck out eight with no walks over seven innings. State of the series: The Dodgers head into Game 2 on Friday (9:37 p.m. ET, Fox Sports 1) with the clear advantage. They have their ace Clayton Kershaw (9-5, 2.73 ERA) on the mound. While Kershaw wasn’t thrilled with the decision not to start Game 1, he accepted it. “I don’t need to prove myself to anyone,” he said. Kershaw’s presence on the mound alone is daunting, but he’s had his struggles in October, posting a 7-7 record with a 4.35 ERA. The Braves counter with Anibal Sanchez, who was 7-6 with a 2.83 ERA this season. Pivot point: It didn’t take long. On the third pitch of the game from Foltynewicz, Pederson sent a 98 mph fastball 400 feet over the right center field for a home run. Forty-seven pitches later, Foltynewicz was relieved from the game with a 4-0 deficit. Man of the moment: Max Muncy, who was a non-roster invitee to spring training and wasn’t added to the 40-man roster until his call-up April 17, slugged a three-run homer in the second inning that lifted the Dodgers to 4-0 lead. He also played a big part in the tiebreaker game against the Colorado Rockies, connecting on a two-run homer in the win. Before 2018, he had five home runs to his credit. In 2018, he led the Dodgers and finished tied for fifth in the National League with 35 home runs. Max Muncy’s 3-run homer has the @Dodgers up early over the @Braves in #NLDS Game One! What you missed on TV: Manny Machado jerseys were spotted in the stands — but with his namesake in a Baltimore Orioles uniform. What fan wouldn’t want to part ways with the Orioles, who lost a franchise-record 115 games, and be traded along with Machado to Hollywood.